How often do you create a dish that has the potential to be a breakfast (or brunch) dish and also a dessert dish? I'm quite excited about this recipe for a couple of reasons, one of which is for the versatility. Second, Old Town Oils currently stocks a cinnamon pear balsamic vinegar, which we gave to Dave's Aunt Bonnie for a Holiday gift. My plan was to purchase a bottle for myself and create a few recipes- so 3 months later, that's what I'm finally doing. This is the first of many cnnamon pear balsamic recipes to come. The balsamic vinegar tastes pretty similar to what you might think, with an immediate hint of cinnamon and an overall sweetness before even reducing it. They suggested pairing this with coffee cake, which sounds wonderful, but I see the possibilities are going to be endless, especially paired with meat. Today however, I was in the mood for a good breakfast. 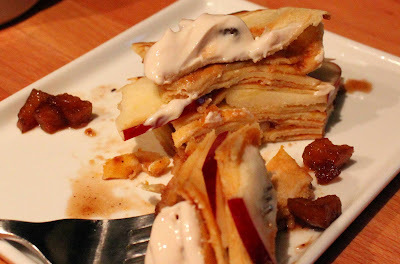 Crepes layered with pumpkin butter and thin slices of fresh apple draped in a balsamic caramel sauce then topped off with Greek yogurt hinted by the cinnamon pear balsamic vinegar. Simply outstanding! Perfect as a sweet start to the day...but I also see this topped with a vanilla or cinnamon ice cream at the end of the day and paired with a spicy Port. Yum. Do not hesitate, make this today! Tip and Techniques: I made small crepes using a small omelet pan so that the stack would be slightly high. It does take some time to make the crepes as the batter needs to rest, so start them well before you plan to eat. Use either pumpkin or apple butter- they will both yield fantastic flavors! You can even skip the apples if you want a more pancake-type of texture; the apples give it a nice crunch though. Mix the flour, eggs, milk, water and salt with a whisk, be sure to whisk out any lumps. Add the melted butter and refrigerate for 1 one hour. Start the sauce below when you begin to make the crepes. You'll make the crepes one at a time, brushing your pan with melted butter often. Pour only about 1/2 cup of the batter in at a time, swirling the pan to spread the batter as thin as possible. Flip when the first side turns golden brown. As you stack the crepes, spread about 2 tablespoons of apple butter between each layer. Add all the ingredients except the vinegar to a small sauce pan and simmer on the lowest heat for 5 minutes. Add in the balsamic vinegar and continue to simmer until the crepes are completed. Pour over the stack of apple crepes. Top with the cinnamon pear balsamic yogurt (below). Mix all ingredients, keep chilled until read to use.